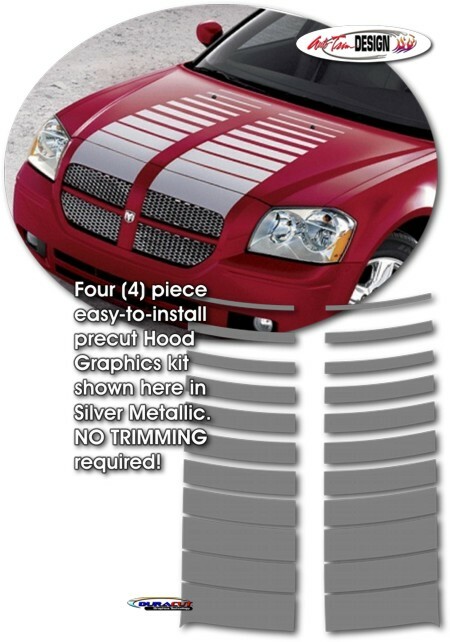 Set your '05-'07 Dodge Magnum apart from the rest with this unique Hood Graphics kit. As you can see, this stripe package is not just a set of straight 15" (38.10cm) strips in a box. Our graphic kit consists of prefitted and contoured pieces as shown in the illustration. This kit is specifically made for the '05-'07 Dodge Magnum factory hood as shown and will not fit any other vehicle. Each graphic panel has an overall dimension of 45.707" x 15.559" (116.10cm x 38.10cm). Graphic spacing at time of installation shall be 4" (101.60mm).